The documentation would have you believe this is a fairly simple process, and since I can't seem to find many others on these forums banging their heads against their desks as I have, perhaps it is in fact very simple and I am simply overlooking something obvious. 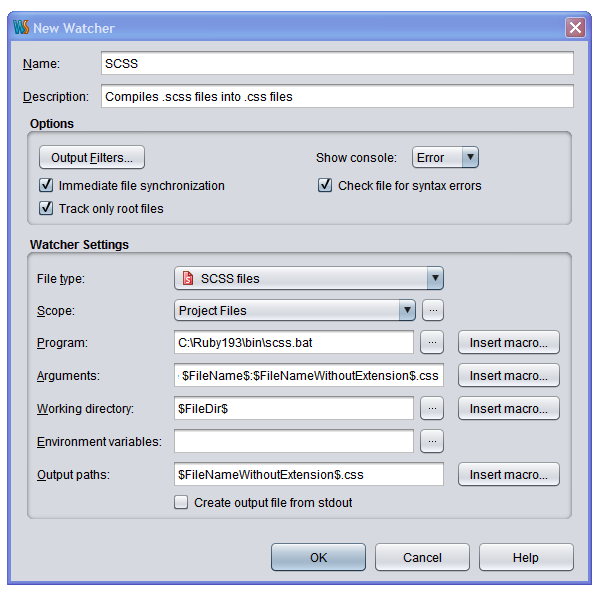 I would like to have the .scss files in my scss folder transpiled into .css files in my css folder. Nothing I seem to put into the Output paths field seems to work. The scss folder and the css folder are at the same level. So you'd think that putting in ../css would work if the Working directory is the default, $FileDir$. I've tried using colons instead of slashes (as per the docs), I've tried back slashes and forward slashes, I've tried updating the settings and restarting WebStorm. I've tried a good number of different approaches in an attempt to get this to work because it would be so frickin' lovely. The documentation would have me use the browse button to select my target directory, but there is no browse button. If anyone has any insight into this problem, or requires further clarification about how I'm going about this, please let me know. Also, what is your project structure? Would you like the generated css files being placed in <project root>/css folder, or to ../css/ folder related to the directory where your scss files are located? You'll notice that I've simply left everything set to their default values because as near as I can tell these are the values I want anyway. I want my css files to have the same names as their scss counterparts. And I want those generated/transpiled css files to appear in the css directory, which would be ../css in relation to the scss directory. While I followed your reply (for which I am quite grateful, btw) I'm still not really sure what arguments I should make or where I would put them in order to achieve my desired goal. which seems to be working perfectly. I can't help but wonder whether there isn't a better way to do this though. If you have any thoughts on that I'd be glad to learn of them. There is nothing wrong with this working solution -- I'm using the same approach (although for different kind of watchers). I think "don't touch what ain't broken" fits well here. It's helpful to verify the paths using the setting: "Show Console" drop down set to "Always"